Authored by gregormi on Feb 4 2018, 3:07 PM. This adds a new "Tools" button to the libksysguard widget which opens a menu that contains tools that help with system diagnostics. Verify that each action in the menu works. Verify that if the global keyboard shortcut for Kill Window is changed, that it is updated accordingly in the menu item. new QMenu(q) or delete in destructor. +1, if Breeze had offered it (or did I just fail to find it so far? ), I would've chosen it for Spectacle. To me it seems quite common to have the need for such a button (now that we have less toolbar + menubar style apps), it might be worth to create a new icon. +2, wanna open a new bug for that? @andreaska can probably whip it up really quickly; he's a wizard with icons. @ngraham Sorry, was busy working on Spectacle and Gwenview so did not get around to this yet. Would you mind filing the bug? @gregormi I think in the meantime we could just use application-menu? gregormi marked an inline comment as done. Just tried the patch. I think for System Activity / Ctrl+⎋ the button is fine (annoyingly with a slightly larger height than the combobox, but that's life…). For KSysGuard itself it looks a bit odd, why would it appear exactly on this tab page? I could imagine the menubar would be a better place. I think putting on that tab seems sensible enough because it's one of the default tabs, and the one that ksysguard opens to. Anybody sho'w such an advanced user that they customize their ksysguard tabs and don't use this one isn't actually going to need these tools in the first place. Some people from Plasma reviewed the original review request on reviewboard. Should we add some more reviewers before it can go in? 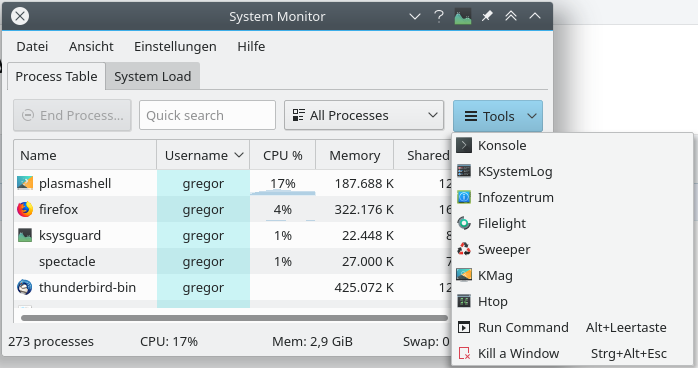 Only looked at it briefly, but I did not spot something about KSysGuard (the multi-page app), it was all about "System Monitor" (the single page dialog) so far. Anyway, I'm not the maintainer, I only added a comment about something I noticed. As for adding more reviewers: I guess someone from Plasma has to approve it in the end, and maybe look at the code again because the original review is quite old by now. Perhaps it's best to tag individual reviewers (from your old review, or from recent Git history). I think the reviewers are aware that the menu will also be part of KSysGuard, which is a good thing. I added Thomas from the original review request and Friedrich as one from the recent commit history as additional reviewers. So the final question to be decided is: "For KSysGuard: is it odd that the new tools menu only appears in the System Table tab?" I would follow Nate's assessment https://phabricator.kde.org/D10297#207235 here and say no and regarding all circumstances it is a good solution. Any more thoughts on this patch before it is ready to land? Sometimes silence equals consent, especially when there have been many requests for comment. If nobody else has an opinion before then, I propose landing this on March 20th. maybe sort the menu alphabetically first? or there's any meaning? The initial idea of the tools menu was to make the Kill Window more discoverable. Yes, Run Command has also a global shortcut (but it is the only additional one). I didn't think of adding the shortcut because there are several ways to start a program. I put Konsole first, because, in my experience, this is what most likely works in case of some unexpected Plasma behaviour. I haven't been able to review the patch in detail myself, but the basic idea is fantastic IMHO. The text should use title case: "Kill a Window"
The parentheses look a bit ugly, in normal menus the shortcuts are simply aligned to the right (not sure how that's done, though). FWIW, I agree with Aleix. At least for Run Command the shortcut should be shown (just like in the desktop context menu). Is Plasma needed here? If so, I think this needs more discussion or should be made optional. 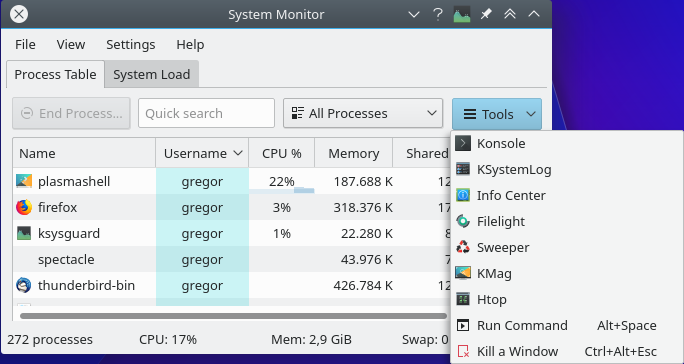 KSysGuard can also be used in other desktop environments and perhaps other apps consume this library too (KDevelop? ), all of them might not want to bring in a huge dependency on Plasma. Yes, it still shows up as a whitespace change on Phabricator. Do you really need this? Maybe it's enough if you don't change this property to true in processui/ProcessWidgetUI.ui:31. What does d1 mean? Is it necessary to duplicate the d-pointer? As far as I can see, you are already capturing this in the lambda, so you won't need to capture (this->)d.
Could you do an exact match on the filename, i.e. only the last part of the full path? There might be situations where "System Monitor" is developed or installed in a directory containing this string by chance. Sweeper and KMag do not show up for me, even though I have both of them installed. Is your naming correct? This looks a bit odd. I would organize this with linebreaks alone, no need for separate code blocks. Please give your variable a more descriptive name. gregormi marked 6 inline comments as done. No, it's not. I'll remove that. I fixed the desktop names. gregormi marked 4 inline comments as done. This now ready from my side. @rkflx: Hi Henrik, I resolved all your code remarks. Could you look it over and give a go to have this landed. Thanks, I noticed your update, but I've been busy (sorry). I hope you don't expect an answer within days if it took you almost 2 months for the fixes ;) Anyway, I'll try to check it until the weekend. Did you have a chance to look into the shortcut issues mentioned in D10297#229850? Great, looking much better than before. As far as I can see the inline comments are done. At least for Run Command the shortcut should be shown (just like in the desktop context menu). After looking into Qt's sources for desktopFileName, I set a breakpoint on QGuiApplication::setDesktopFileName, and ended up in KAboutData::setApplicationData. …which looks related (did not check in detail, though). DONE: using QKeySequence::NativeText; tested with "export LANGUAGE=de_DE"
gregormi added a reviewer: rkflx. Do you think it is really necessary to display not set? For me, an empty string would also work just fine, now that you are using \t instead of (…). This comment was removed by gregormi. It was supposed to serve as reminder of how the parameters for the globalShortcut method were determined. To help debugging later. Should it be removed? Yes, is this much better. Might there be a chance of a some kind of keyboard shortcut conflict because we now set it also locally? Nice, accepting this for now (there's still one simplification you could make, though, see inline comment). I only checked that the code looks good and it works fine. I'm still not too happy with how this is a button instead of a menu in KSysGuard (D10297#207127). However, that's for Plasma to decide. I'd appreciate if someone from the long list of Plasma reviewers (on Phab and from ReviewBoard where this patch was submitted in September 2016) could also approve the final version. If no one speaks up within a week, I'd say you can land the patch. At least elsewhere there is no such comment and I doubt the object's name will change in the future, but if you want to keep it, that's also fine with me. Not sure whether there are any guarantees, but at least swapping the shortcuts between Run Command and Kill a Window, we can observe that in case of (silent) conflicts the global shortcut has precedence, i.e. "it works"™. Perhaps only setting the string is cleaner, but then due to \t we'd have RTL problems again like in your other patch. I'd go the shortcut way, unless anybody from Plasma comes up with good reasons not to. Awesome, thanks for your patience over the last months. You're welcome. And: thanks for the patience to help improving this patch comes also from my side :).